I verified my word count once I hit 50,029 words this morning, but the novel is far from over. Of all the chapters I made sections for in scrivener, there are at least five still waiting for me to write them. The plot changed drastically about half way in, and it’s reflected in the rest of the work, I know. In the end the novel will be about 75k, judging by the rest of it, which is a pretty decent length all in. My biggest worry about completing a challenge like this was that writing so intently in a relatively short period of time would cause a burn out. I suppose I thought I’d be sick of The Reach and all the little rocks that made it, by the time I hit my word count today. But I’m not, amazingly. I want to go on, to explore all these little random tidbits that have infiltrated my plot without me really noticing them. Which is good, because it’s going to take a lot of work to get this story anywhere near a publishable standard. But all the future work I’ve yet to do aside, I am so stupidly happy to have written so much this month. It was a struggle sometimes, I’ll admit. The words didn’t always come easily, but I think I learnt a valuable lesson because of that. Sometimes, you really do have to just sit down and write. To hell with inspiration, motivation and ‘feeling it’. In the end, my perfectionist tendencies will have to take a back seat, if I ever want to get this story or Underground in print. And so, Camp was a success, all in all. I know a few of you guys were taking part as well; I hope you got to where you aimed to be today and if you didn’t? I bet you still have way more done than you had on the 1st. Celebrate anyway! If you fancy creating your own, check out this website! It’s so much fun! *Unless you’ve been reading Pratchett or something. Mmm. Discworld. Oh I looove that website! 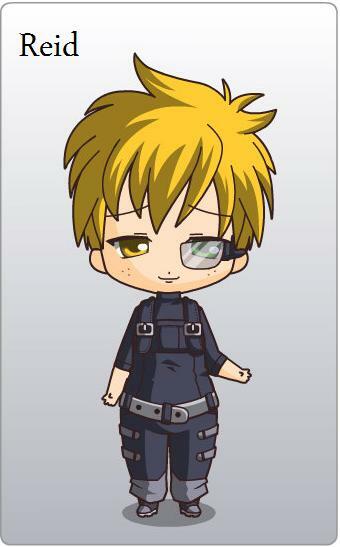 It’s so much fun trying to make your characters! Congratulations!!! 50K in a month earns you heaps of bragging rights. :) Also, can I just say that I love the screencap from Scrivener? 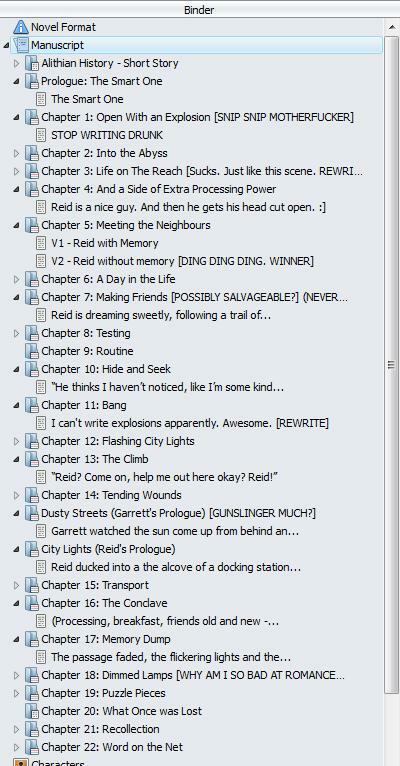 I’m kind of inspired to start a tag on Twitter for showing off Scrivener WiPs to see how people organise their stuff. I reached my goal too, but it was set so low that I was never in any real danger this time. 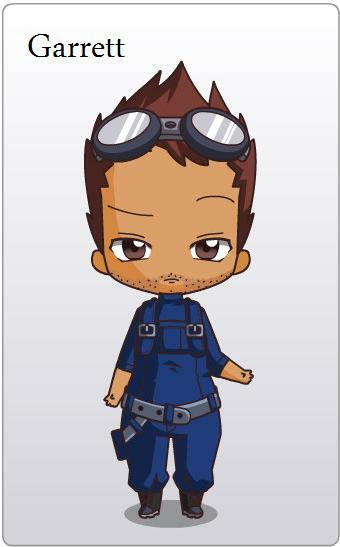 ;) Aww, your chibis are cute! Cool! Hmm … What should the hashtag be? #ShowYourScrivener? #ScrivenerWIP? Haha, it’s not a responsibility I regret. ;P Aww. Feline Reid is honoured to be honoured! Okay, hashtag, well I like both of those! #ShowYourScrivener almost sounds dirty, which is hilarious. And #ScrivenerWIP is nice and short, saving those precious characters. I wish I could think of one but I can’t! I would totally follow that tag. It’s always fun and inspiring to see other people’s Scrivener methods and binders. It’s kind of a peek into their writing methods. Congrats! I didn’t win Camp Nano myself this month, but I did get a lot more editing in than I had before! Thank you! And like I said in the post celebrate anyway. :D Editing is the hardest part sometimes and almost impossible to relate to a word count. Sounds like you did good to me! And feel free to get on Twitter and show yours off too! My binders are always pretty silly looking. I’d love to see yours!